I'm not a serious birder, but I do enjoy bird watching while I'm out looking at Ohio's natural areas. I came across a few interesting things at Dillon Lake State Park that I need help with. A pair of Common Goldeneyes? Thanks Adam and Lana for chiming in! Adam, my only other angle is with the birds head turned away, so I don't think that would give any more clues, but if it does, I'll post the shot. I'm going with immature red-tailed (could he still be a juvenile in February? It has the white mottling on scapulars that we like to call "backpack straps." The heft and bulk of the bird feels like a redtail to me, not to mention the large bill. Reddish tail, too! Now, Tom, what IS that viburnum I photographed on my blog?? Thanks Julie, You are awesome. About the hawk photo. Yes babies born last spring will be juvenille until they molt in the spring. You can tell by the bands on the tail,(will molt to the adult red) and the yellow eye. 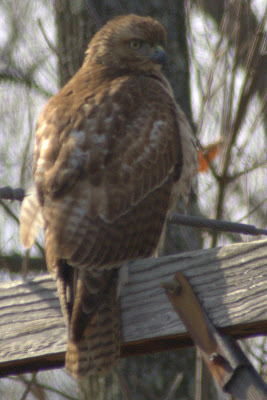 (turns darker with age) My guess without seeing size would be redtail, but it could be a broadwing(?). I haven't had experience with them and have never been far enough east to see them. Thanks Stacey for help with the I.D.! The goldeneyes are correct! The second shot is a grebe, but I can't tell which type (or which types you guys have out there). Young raptors are tough...I defer!